It’s no secret that this has been one of the most anticipated films of the summer. It is also no secret how Cap’s previous cinematic attempts were major disappointments. However, this film manages to shatter the dark history of a character that has mostly stayed in either animated or printed form. The story of this film is ripped straight from the comics, US Army Private Steve Rogers (Chris Evans) is brought into a secret government experiment and turned into a new breed of super soldier. Donning the identity of Captain America he battles against the forces of HYDRA, a rouge science division run by Johann Schmidt (Hugo Weaving), better known as the fearsome Red Skull. The first thing I have to say about this film is both how faithful it is to establish Marvel canon and how faithful it is to the time period. The resulting blend makes this truly feel as if we have stepped into the Marvel Universe and are seeing it come to life. There is so much attention to detail that they even placed some subtle nods to the Marvel heroes that ran alongside Cap in the early days of the company. The story and pacing of this film feels both complete and epic as it fully covers all of the aspects of Captain America as both a symbol and a person. 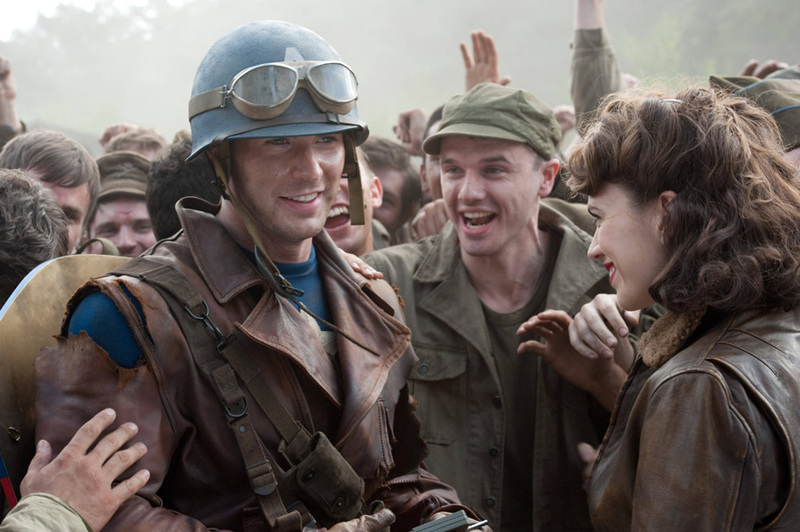 The film even pays homage to the propaganda aspect of the original comics, complete with a recreation of the iconic cover of Captain America Comics #1 from the 1940s, as well as incorporating many wartime songs and newsreels used to promote the war effort. There’s even a throwback to the Captain America serial from the 1940s. The characters in this film are fully realized and very believable, which tends to be rare for most superhero films. This is made all the better by the high quality performances given by the actors. Most notably, Chris Evans, whose performance as Cap is far superior to his performances as Johnny Storm in the Fantastic Four films. Even the supporting characters are really believable, such as the MCU’s version of James “Bucky” Barnes (Sebastian Stan), who is an adult in this film as opposed to the young sidekick from the comics. Haley Atwell also does an incredible job as Agent Peggy Carter, who is an agent first and Cap’s love interest second. Another notable performance comes from Dominic Cooper, who plays Howard Stark, father of Tony Stark, aka. Iron Man. Howard Stark is just as flirtatious, wild and as brilliant as his son, showing how Stark Industries became what it was in the Marvel Cinematic Universe. Overall, this is by far the best film to come out of Marvel Studios to date. The story is well-paced and engaging. The characters are well developed and believable. This film establishes what looks to be the groundwork for next summer’s The Avengers. On my scale, this film gets a 5/5. If you are a fan of WWII movies or a long-time “Marvelite” this film is a must-see. Side Note: Be sure to stay after the credits to see an exclusive trailer for The Avengers.